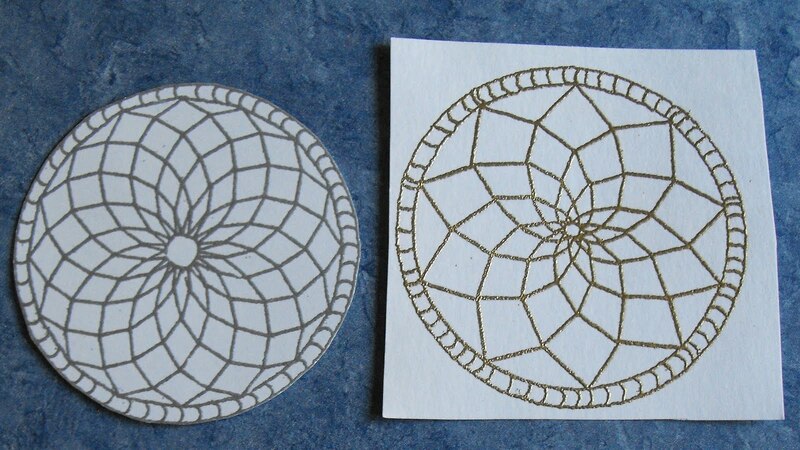 I got my first suncatcher stamp in a fabulous grab bag special years ago from Biblical Impressions. I had never heard of suncatchers, so did not recognize what it was, just thought it was a neat geometric design. And although I have since heard of them, and confess I do not care to use the stamps as such, I still love the creative ideas they generate. I made a batch of impressions of the 16 pt. suncatcher, embossing all with silver and went to work. After the first idea I had (and will post next time, actually), I decided, as the suncatchers come in four levels of "depth," that I would order the 8 pt. suncatcher. A flower was an obvious shape to make with the stamp, and I filled in with H20's. While I had planned to make a card with it, my eyes happen to light upon this little trinket box, and although the green was not a perfect match, the image looked perfect on it. I haven't permanently attached it yet, but when I do, I will use foam dots to give it a 3D look. With the 8pt. design, A star seemed the obvious design. I embossed the image several times, embossing some in silver and some in gold. I then embossed the Psalm 36:5 scripture in gold. The panel is Yuzen Washi paper. Next time I post for Biblical Impressions, I will have two other, very different cards made with the same stamps. 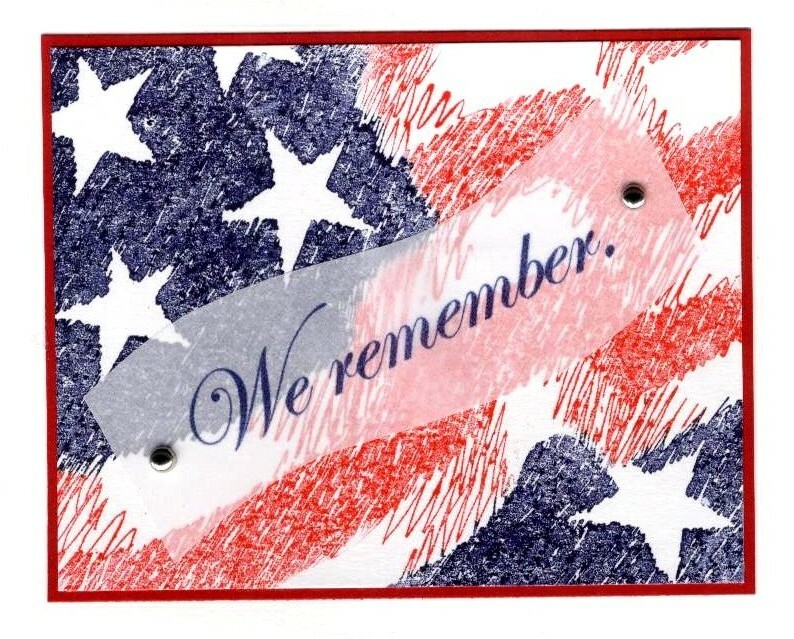 Somehow, even though I've always appreciated what the soldiers and sailors have sacrificed for our nation, I still, maybe not consciously, but certainly by my actions, thought of Memorial Day parades as I do all parades: events for the children. After dutifully making it a full family event, I eventually deputized my husband to take the children while I enjoyed a quiet house (with four children barely over four years apart in age, perhaps you can understand the need for that!). But after reading a fascinating book about a vet, including a scene with a Memorial Day parade in which almost no one attends because of the cold, but the aged vet is there, I am realizing that my perspective has been decidedly shallow. While I did feel a surge of emotion as the veterans walked by each year, it never occurred to me what they might think about the level of turnout at a parade, that they might have a need to see that people in their community had not forgotten their sacrifice, or the sacrifice of their comrades. 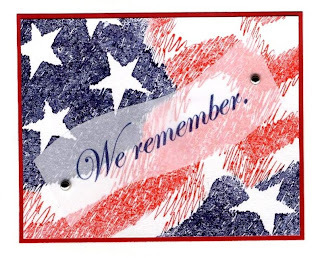 And then another thought struck me while reading an internet article about mothers of fallen troops, and I realized that in milling around in the Memorial Day parade crowds, I might be brushing shoulders with a mother, father, wife, husband, or child of a fallen soldier or sailor. Wouldn’t they also have a need to see that their community was aware of the price they had paid in supporting their loved one in his/her decision to serve? I confess, a lot is happening this week, and I haven’t finished college for the summer yet, so it’s going to be hard to drag myself away this morning. I hope I will, and I hope you will too. Text is computer generated. Flag Background is from Eureka. I wish I had a camera that could have given a better idea of the almost 3D shimmer of the wallpaper I used for the background, it's really gorgeous. The text, which I embossed in gold, is available in both English and Spanish.I used a chalk ink for the English and Spanish.I used a chalk ink for the bouquet. Hi, it's Roxie here and I have a couple cards showing images for the kids. To give to the little person. The line embossing on the edge was done with the Scor-Pal. The greenery with the flowers was cut with the Martha Stewart - Branch punch. The tiny blue flowers are also punched but no name is on the punch which was a gift. The flowers were attached with Aleene’s tacky glue. And to welcome a new little person. Nestabilites were used to cut all the layers and emboss them. I glued a piece of scrap cardstock on the left underside of the scalloped panel so it lies even on the card since the right side is resting on the rick rack layer. EK Success Zig Zag punch was used to cut the rick rack and it’s glued to the card with Aleene’s tacky glue. 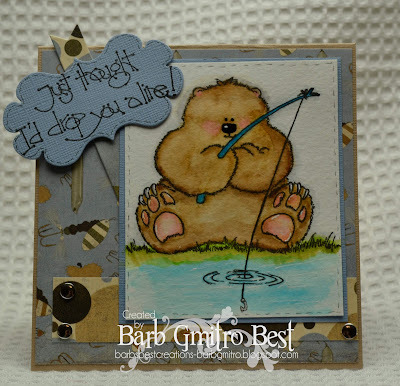 The sentiment is a digi image from Eureka Stamps and it’s colored with Copic markers. The end of the week is nearly here! I am looking forward to the long weekend! We are meeting my daughter and my two sisters in San Luis Obispo. Really looking forward to seeing them! I have a quick and easy card that has a lot of impact to share with you today. 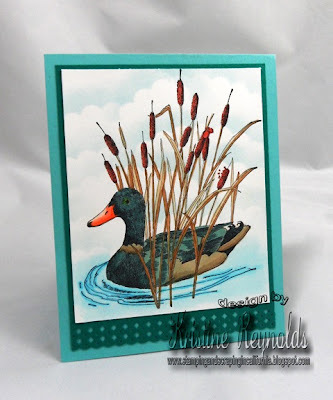 This image is Mallard by Eureka Stamps. It's such a great image that I kept the card really simple so it wouldn't take away from the duck! This is a great "GUY" card. Leave as it is or add a sentiment...birthday, father's day...or just because. 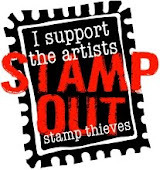 I get a lot of use our of this stamp and it's available in rubber or digi! The entire image was colored with Copic Markers. I stamped the Flowering Vine onto white cardstock and colored it with FlexMarkers, layered it onto some blue polka dotted cardstock and adhered it to my card base. This is when I ran into the question of the sentiment. I wanted the vine to run up the card, because these are Morning Glories and the ones that we had in my yard when I was a kid, grew up the fence. But once I added the sentiment I started to think the card looked better as a horizontal card. I guess it could be used as either. What do you think? Leave me a comment and let me know which way you would use this card. Vertical or horizontal? Thanks for stopping by today, come again soon. Today's card uses two of Eureka's funny stamps. I made this card large to make the most of this fun image. The image is colored with Tombow markers. Hi! I hope you are having a lovely day! I used FlexMarkers to color the Heart Bouquet and printed Blessings from my computer, as it is a digital image which also comes in red rubber. 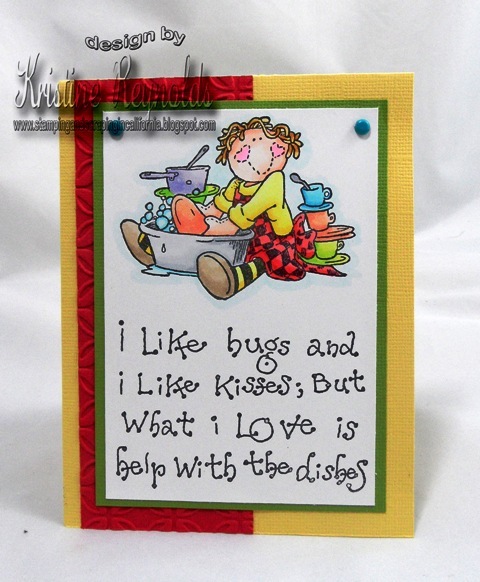 I love the digital images for sentiments. You can size them to whatever size and color you want. I thought about matching up the pink to print the Blessings, but the color just didn't show well. You can also get "Heart Bouquet" in digital form. 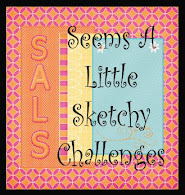 I like to use the rubber stamps for my images, especially if I will be using alcohol ink markers to color them. Stop in to Eureka! Stamps and check out the images, there are sure to be some that you will love. Whether it is red rubber or digital, there will be something for you! Leave a comment if you wish. Come back soon! 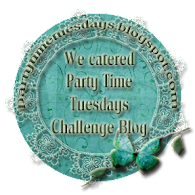 Welcome to the May Blog Hop for QKR Stampede! This month we are all about flowers. we thought a floral theme was quite appropriate. hop on back here where you can link up again. Please leave comments along the way, all our ladies love to hear what you think of their lovely projects. red rubber and digital stamps they offer. I'm sure you'll find something you'll love! Thanks for hopping along, come back soon to see what other inspiration we have to show you. I hope your week has been going well. I am looking forward to the weekend and hoping to have time to stamp! I am starting to stock up on cards to send to my son while he is away at college and this is one that I made. Like most 17 year old boys he doesn't like bright, froo-froo cards. I think he'll like this one because it's monochromatic and simple. 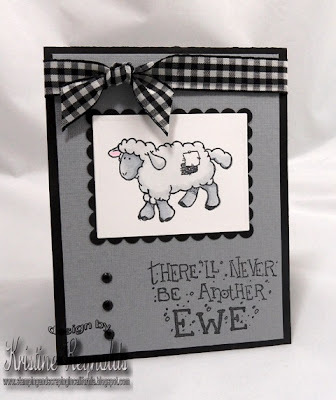 I love this sheep stamp and there are lot's of cute sentiments to go with it in the store too! I have always loved notebooks and journals. I don't personally manage to maintain a journal, but just owning them makes me happy. :-) I used to make journals for sale, up through last Christmas, but although I still have a bunch left, I probably will continue to make them! For the He Has Shown image, from Micah 6:8, I embossed in gold. The journal is, as mine always are, covered with wallpaper. By using wallpaper and mitered corners, the journal can be easily wiped clean, and the corners do not get mashed like they would with paper. 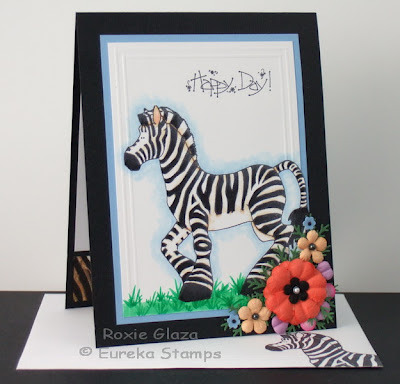 May Eureka Stamps Blog Hop! I hope all you Mom’s had a fabulous Mother’s Day! of the great Eureka images that you can use for Wedding and Graduation projects. I don’t know about you but those seem to be the cards I need in June! If you get lost along the way or a link is not working, just hop on back here and get back on track with the list below. 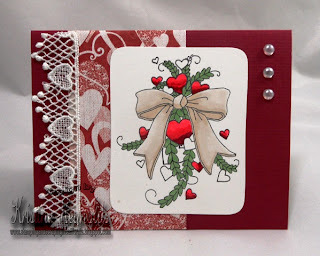 Here is a Wedding card I made to start off the blog hop for you. I used Heart Bouquet to make it. where I hope you'll leave a comment telling us what you thought of the hop. And please leave comments along the way. All the design team ladies love to hear what you think. Then pop on in to the Eureka Stamps Store and see what might strike your fancy. It' s my day to show off a Eureka Stamp. I fell in love with this stamp 21201 Butterfly and Bluebonnet. It makes a beautiful Sympathy, Thinking of You or Get Well card. We also have a Eureka blog hop coming up on Monday so check back for that. 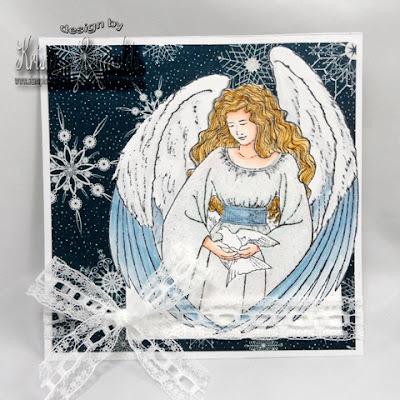 Today I have another beautiful card made with this Angel Stamp from Eureka Stamps. I cut her out so that more of the paper would show but kept the card pretty simple to leave the focus on her! I used some snowflake paper that has been in my stash forever but with the angel image I think it looks like stars in the sky. but I thought I'd be the first to say it. I made this card using 2 stamps from QKR Stampede. I stamped the Bouquet image onto white card stock and colored it with FlexMarkers and inked the edges. 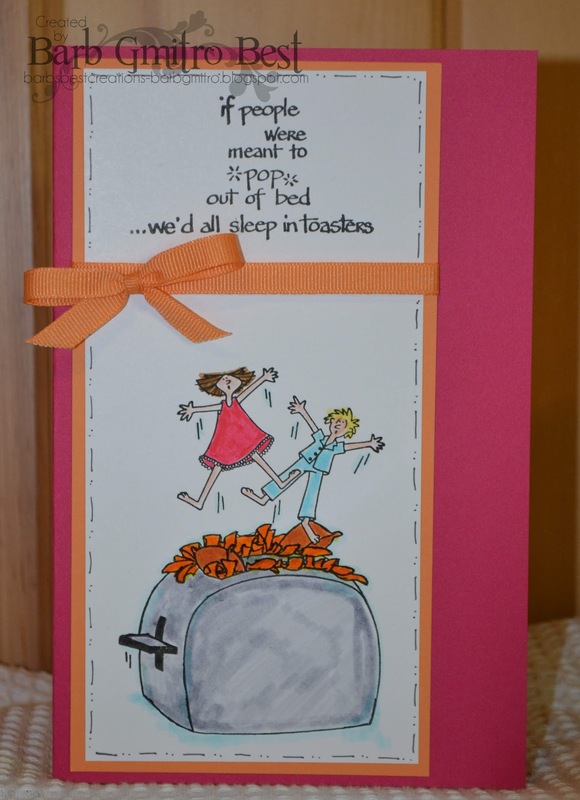 The sentiment was stamped with the same color ink as I used to ink the edges and that I used to create the base paper. 1. Ran a piece of waxed paper through the Cuttlebug in an embossing folder. 2. Put a piece of white card stock on either side of the waxed paper and ironed over it. (Place a piece of scrap paper over it before ironing so you don't get wax on the iron.) This transfers the wax to the card stock. 3. Inked the card stock with direct to paper technique. This means you put the ink right from the pad onto the paper. You could use a blending tool if you wish. The wax acts as a resist. 4. Use a paper towel to buff over the entire piece, this will remove any excess ink that is on the waxed areas. 5. Use the newly created patterned card stock. Make a stop into the QKR Stampede shop and see what images you can find that will be great to use with paper you create with this technique! I hope you enjoy my card as much as I enjoyed making it. Leave a comment if you wish and come again soon. Hello! Today's post is for Eureka! stamps. and Drop you a line. with Tombow markers and a waterbrush. Background paper is from Paper Loft. I used water color crayons to color this lovely image. I then used the "out of the box" method to cut it to size. I love the look of those bits that are fussy cut on the outside of the image. "out of the box" cutting. If you like this image, you should go check out all the wonderful images they have in the Eureka! Stamps Shop. Every time I look I find something that I missed last time I was there. There are so many wonderful stamps, rubber and digital! Thanks for stopping by today. Come again soon. Good Morning! Jessica B. here for QKR Stampede today! I had fun doing this little card. I made a scene..( I know, you are shocked :)). First up, I used this little frog..isn't he keeutee?? Now admittedly I am not a "cute" card maker. I LOVE what others can do with cute stamps..but when you have a fear of patterned paper..you really just need to know how to color well and hope for the best..which is the motto I live by HA!..but QKR Stampede had some CUTE images that even I can pull off ~wink~. Plus, as we all know, I love me some frogs..and turtles..and butterflies....hmm..I am seeing a pattern here , you? Ok, so this card was a collaboration of stamps if you will. First up I used the frog, then I used these rocks, and this grass. Now you KNOW I had to mask something right? No card is complete without masking. So to start off, I stamped el frogo. Then I inked up only part of the rocks and stamped them. Then I stamped the grass behind the rocks..and decided the frog needed something behind him because he was just looking like he had been plopped down on his lily pad..so I masked him and stamped the grass over him..then it looked right. So I began coloring. I wanted to make the frog look as though he was sitting on the waters edge so I "built" up a sandy area..see how some of the rocks are in the water..and the water is just to the edge of the sandy area?? That was intentional. I used a combination of Faber Castell Polychromos pencils and Prismacolor pencils. Then I stamped the grass kinda in front of the rocks to create a bit of depth. I added extra dark shading under the lily pad and the rocks in the water to create some depth..and added a bit of a darker brown to the parts of the grass where it meets the dirt if you will..also to keep the grass from looking like it was sitting on top of the ground...there is a method people..I promise. Now, I kinda lost some of the detail in the dragon fly..mainly because I stamped EVERYTHING in green ink. Yes, you read that right..GREEN ink. I don't always like to color something in that is outlined in black...that way you can give certain images a more cohesive look..a bit more natural if you will. BUT, you do lose a bit of detail in doing that. You can still see the dragon fly..in person you can see the details of his little face..but not in the pic. Lesson learned here. Ok..that is it for me today! Please stop by the QKR store and see what other cute images you can pick up..
Hi there! Today I wanted to share a card I made using the Faith Hope stamp from Biblical Impressions. This stamp is actually one big stamp, but I cut it into 4 sections. As you can see, I went with a long card this time. I cut each part of the stamp apart, and layered onto the base. I did some paper piecing for the flower pots, and colored the rest of the image with marker. For the watering can, I used some liquid pearl (as you can see from above). Last I hand wrote the sentiment on using a marker. Well that is all from me for now. Have a great Monday! I went a little crazy with the images from the Dragonflies full sheet from Biblical Impressions! This first card has the large butterfly. I embossed with Purple Pastel gold leaf, then painted in with H2Os. The cardstock I used has a slightly bumpy texture, which in turn gives the gold leaf a bumpier appearance. I like the effect! For the shadow butterfly, I used irridescent mica powders. I used a paintbrush to apply the color in splashes, then when fiinished, gently used the brush back and forth over the whole panel to get every area coated. If you look closely at the edges, you will see a slightly smudged look: I handled this too soon after embossing. Unlike gold leaf and embossing powders, mica powders need to be left for awhile to "set" before cutting. I hadn't used these in a long time and had forgotten. Here is a picture that includes all four of the butterfly images ... do I have an obsession with embossing??? ;-) I think Biblical has a stamp that says something like, "so many stamps, so little time;" I think I would reword that to "so many techniques, so little time!" at least for these stamp images! Note that the shadow butterfly shown here is a more accurate rendering than the photo above. By the way, if you look at the medium butteflies, embossed on dark green, blue, and red marbled cardstock in the upper right corner, there are a few spots of chipped gold embossing. This is because I did not trim them right after embossing. On glossy cardstock, both gold leaf and embossing powders get dryer as time passes, and so will flake off when cut. However, shortly after embossing, there is still enough moisture to keep this from happening. 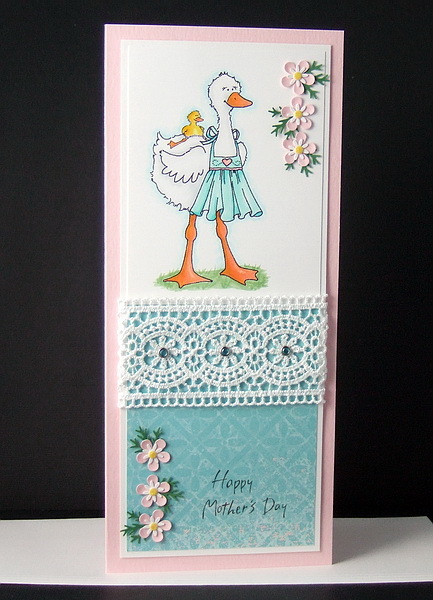 I think this cute Mother Duck and baby from Eureka Stamps will make a nice Mother’s Day card for my granddaughter to give to her Mommy, it's it the cutest image! This is a tall card - the front measures 4" x 9.25". Cut the cardstock 8" x 9.25" and score to fold at 4" of the 8" width. This will fit in a business size envelope that you can find in department and many dollar stores. The image section and designer paper were taped together on the back to form the one panel. The Decorative Trim lace was taped to the back side of the double panel with single sided tape and the holes for the brads were created with a Bazzill piercer. TheEK Success flower punch was used to cut the pink flowers and they were debossed using a metal ball stylus and folded paper towel for cushion. The tiny white flower is cut using a Fiskarsborder punch and the yellow center is cut using the Cuttlebug and their Tiny Tags die, I punch out ¼” circles and place them over the hole for the tag and run through the machine. The leaves are cut using a Martha Stewart Branch punch and I punched only a portion of the image. These were attached together and to the card with Aleene’s tacky glue. The envelope got three simple lines scored with the Scor-Pal. Well....not really...but I do love these stamps! I have a very quick and simple card to share with you today! I found this cute image and sentiment on the QKR Stampede sight and just had to get it because it made me smile! This adorable little Rag Doll was fun to color. I'm sure you'll be seeing more of her from me in the future! HI! This is Jessica B. here for Eureka Stamps today! I made a cute little tag to go with a tea pot I bought for a dear friend for Mother's Day. I used this sweet tea pot stamp! I stamped it in Archival black that I stamped off first to make it lighter and then die cut and embossed it. I colored the image with colored pencils and OMS..and did a bit of very light sponging. The little "For you" is written with a micro pen. I set a flower shaped eyelet and tied on a sage green ribbon. ..done deal! I hope you are having a great entrance into May where you are. It is beautiful on the SC coast here! Scenic coloring is always a challenge for me, but I like working with images where coloring is very straightforward, so this Stained Glass Dove was perfect for me! I used H20s to paint the colors onto the embossed image. I then embossed the image a second time onto a transparency. I attached the embossed transparency after applying a thin line of diamond glaze along all the black "framing" of the "glass" (When you emboss the plasic it will buckle, so I had set it overnight under a weight to flatten it down, and repeated that step after attaching the two pieces.) The Galatians 5:22 scripture is not embossed.